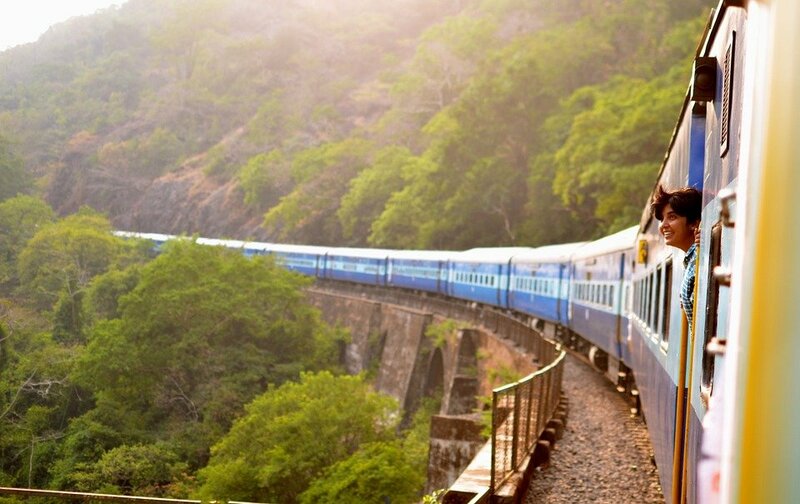 There are five different ways you can travel from Bangkok’s main train station, known locally as Hua Lamphong train station, to destinations across metropolitan Bangkok. 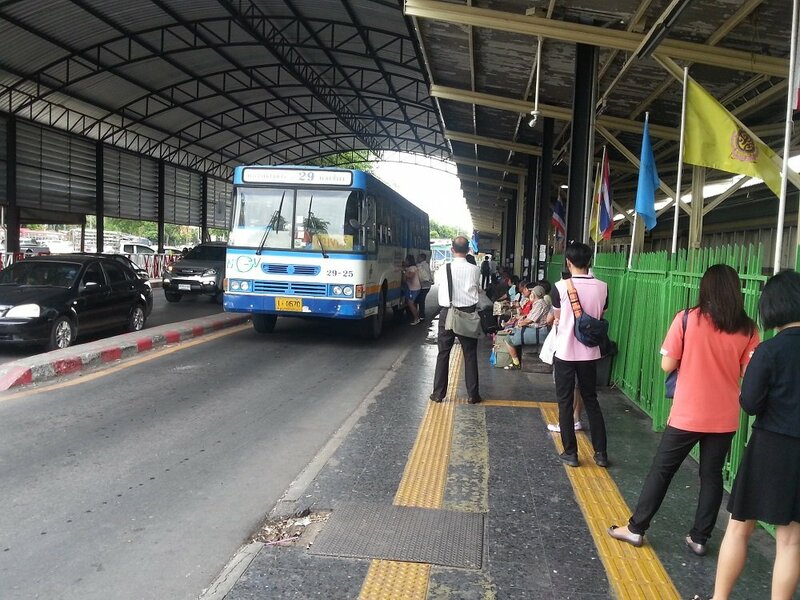 Many visitors arriving at Bangkok train station, especially for the first time, automatically head for a taxi. However, taxis are only one of the available options and other forms of transport can sometimes be much more convenient, quicker and cheaper depending upon where you are going, how may people are travelling and whether or not you have a lot of luggage to carry. The metro (MRT) system in Bangkok is fast, efficient, safe and reliable. Trains run from 05.30 to 24.00 Monday to Friday and 06.00 to 24.00 on Weekends and Public Holidays. Hua Lamphong is at the bottom end of the Blue Line. 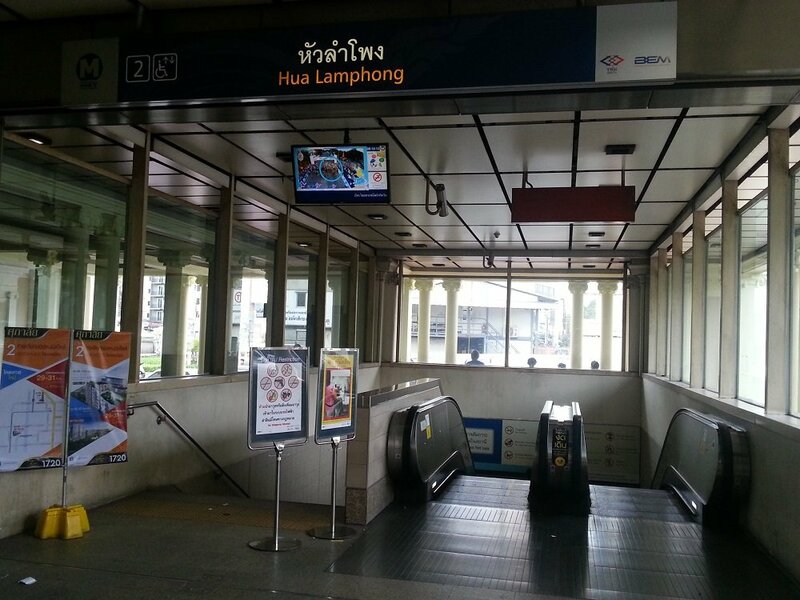 There are several entrances to Hua Lamphong MRT station. From the train station you can enter without crossing the road by exiting the station building at the left hand side exit near the train platforms and turning left again. The entrance is 20 metres from the left hand side exit from the station building. Tickets can be purchased either from the station kiosk or the ticket vending machines which accept coins and notes in Thai Baht. The vending machines have an English language option and you select your destination on a touch screen to select the correct fare. For single journeys a plastic token rather than a ticket is issued. There are interchanges to the Skytrain (BTS) network at Si Lom and Sukhumvit stations. There is an interchange at Phetchaburi MRT station to the Airport Link which goes to Suvarnabhumi International Airport. From Chatuchak Park MRT station it a 5 minute taxi journey to Morchit Bus Station. Meter taxis in Bangkok are relatively cheap. Off the meter they become more expensive. 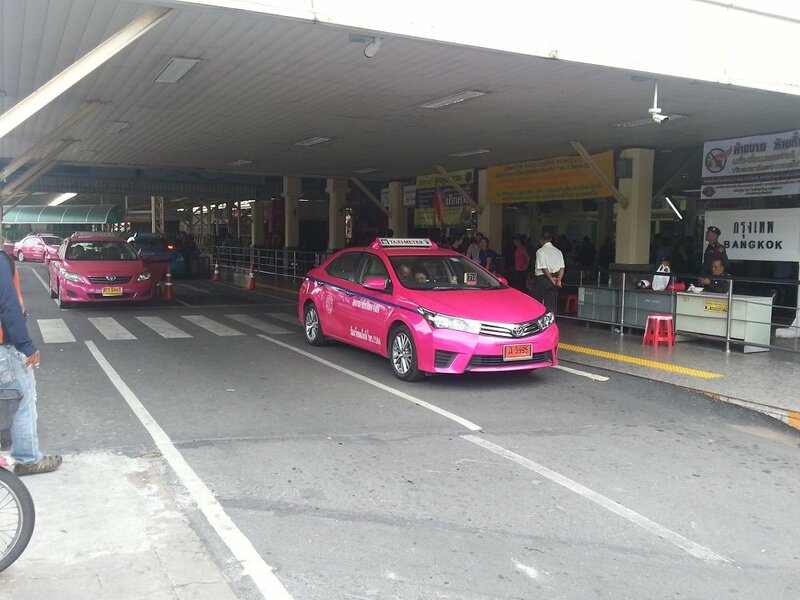 Before you set off on any taxi journey in Bangkok be sure to agree with the driver either that the journey will be on the meter or alternatively a fixed price for the journey. There is a taxi rank outside the train station near the entrance to the MRT station. To reach the taxi rank exit the station concourse at the top left hand corner near the train platforms. NB: these are approximate prices the actual price depends the precise route taken and the amount of time spend in stationary traffic. The traffic in Bangkok is notoriously bad. At busy times of the day we recommend avoiding taking long taxi journeys. For journeys across Bangkok, such as the journey from Hua Lamphong train station to the Sukhumvit Road area, we do not recommend taking a taxi the whole way as the journey may take more than an hour because of the traffic. 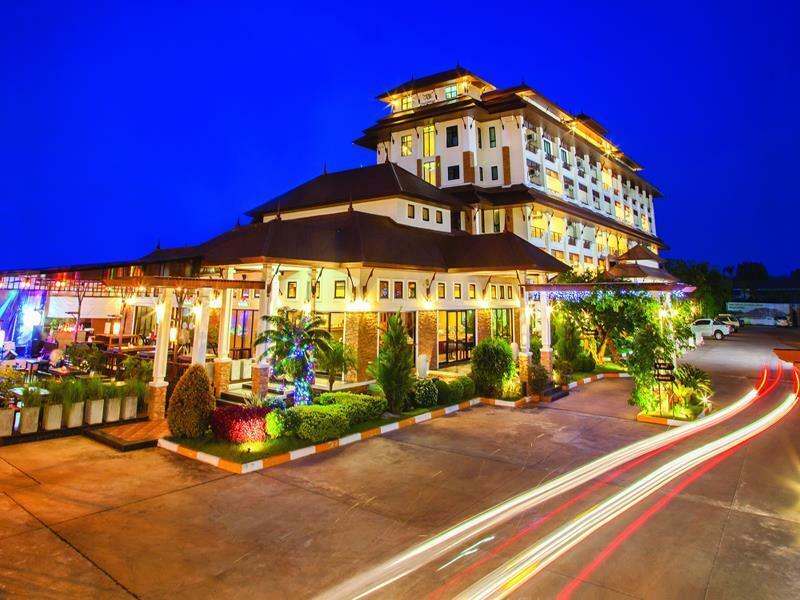 We recommend taking the Metro to a nearby stop and then taking a taxi or tuk-tuk for the remainder of the journey. Motorbike taxis are a quick and cheap form of transport. They weave in and out of the traffic, mount pavements, and a variety of other prohibited manoeuvres to get you to your destination quickly whatever the traffic. Accidents occur more frequently than with other forms of local transport. 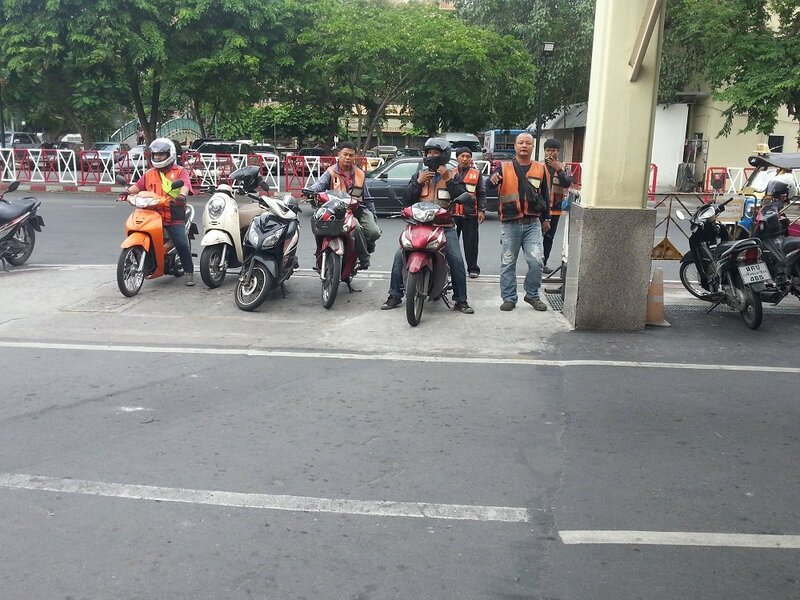 Motorbike taxis will not suit most visitors coming to Thailand for a holiday, although they can provide a useful form of transport for short journeys by those travelling on their own. They wait near to the station on the other side of the road opposite the taxi rank. Again leave the station building at the top left hand exit and you will see the motorbike taxi waiting in front of the parking area between the station and the Krung Kasem canal. Tuk Tuks are the most famous form of transport in Bangkok. However, they are more expensive than meter taxis and local people tend only to use them for short journey and for transporting things. 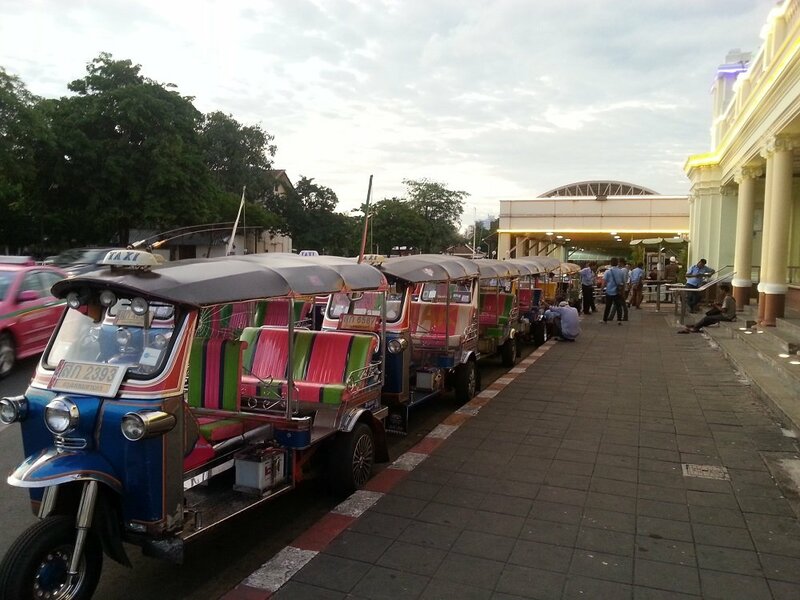 In the mornings in Bangkok you will see tuk tuks carrying goods for sale at local markets. This said they good fun to travel in, particularly in the evening when it is cooler, for short journeys. They wait on the left hand corner of the train station building opposite the entrance to the MRT station. If you are at the front of the station walk around to the left and there will be a row of them waiting for passengers. Bus travel in Bangkok is very cheap and public buses go almost everywhere. However, they are extremely slow and some have no air-conditioning or fans. It is best to travel on buses in Bangkok at night when it is not so hot. The bus stop is to the left of the train platforms. Leave the train station building at the top left hand exit and turn right. The bus stop is in front of the green metal railing between the road and the train platforms.